Richard A. Arenberg is a Visiting Professor of the Practice of Political Science and Public Policy at Brown University. Previously, Prof. Arenberg also was an Adjunct Lecturer in Political Science at Northeastern University and an Adjunct Lecturer in Government at Suffolk University. For 34 years, he served on Capitol Hill, including 4 years in the House and 30 years in the Senate. He held senior positions with Majority Leader George Mitchell, Senators Paul Tsongas, and Carl Levin. He served on the staff of the Iran-Contra Committee. He was one of the principle negotiators and drafters of the Alaska National Interest Lands Act which President Carter called “the most important piece of conservation legislation passed in the 20th Century. His oral history with the Senate Historian was published and can be read or heard on U.S. Senate website. 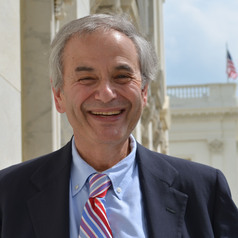 Prof. Arenberg co-authored Defending the Filibuster: The Soul of the Senate with Robert B. Dove, parliamentarian emeritus of the U.S. Senate, which was published by Indiana University Press in 2012. A revised and updated edition with a new chapter discussing the use of the “nuclear option” and with a new Foreword by Senator Olympia Snowe was published in January, 2015. Defending the Filibuster was named “Book of the Year in Political Science” by Foreword Reviews Magazine. He is member of the Board of Directors of Social Security Works and the Board of Directors of the Social Security Works Education Fund, and a Senior Congressional Fellow at the Stennis Center for Public Service Leadership. He has written numerous opinion pieces published in the Washington Post, New York Times, Boston Globe, Providence Journal, Politico, Roll Call, The Hill, NEWSMAX, and other publications. He has appeared as a commentator on MSNBC, the BBC, NPR, White House Chronicle, ABC News Radio, SiriusXM Radio, C-Span, The Diane Rhem Show, Al-Jazeera America, and the Huffington Post Live among others.